The J.W. 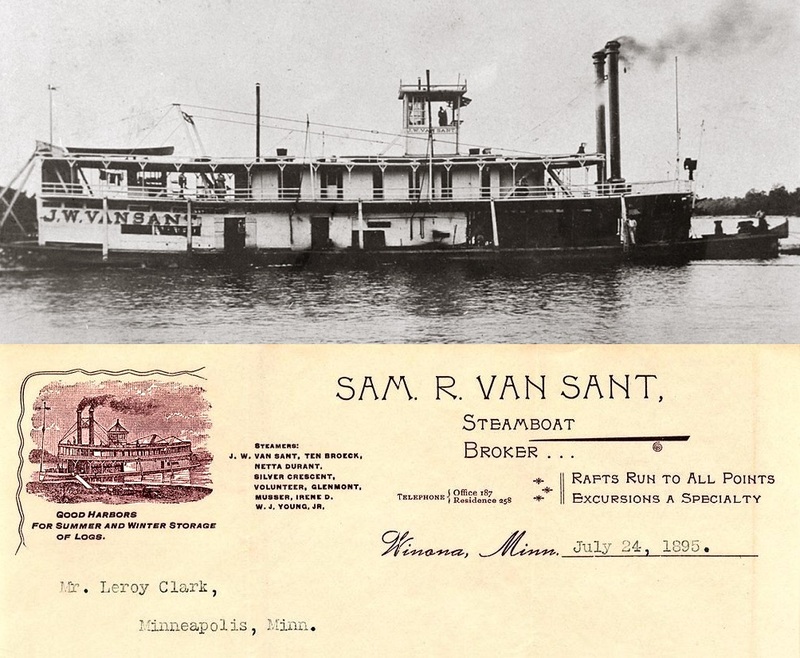 VAN SANT was built to be capable of lowering her stacks and pilothouse to follow her rafts under the Rock Island bridge. 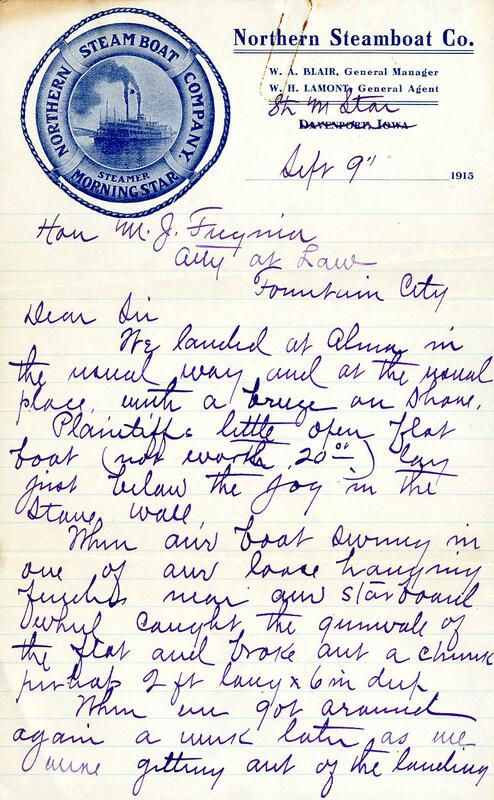 Frederick Weyerhaeuser of Rock Island, Illinois was a passenger on her first trip. Her first tow was for the Weyerhaeuser and Denkmann sawmill from Cat Tail Slough to Rock Island. Acme Packet Co. Line Steamers Letterhead date April 6, 1910 with steamboats J.S. (JOHN STRECKFUS) and W.W. (Walter Wishered) featured in photo graphics. Attached today's arrival . . . letterhead and envelope from the GORDON. C. GREENE scanned with the best of my 8 different "real photo post cards" of the boat. Rather modern styling for the steamboat "logo" art. She was withdrawn from service in 1951, this could date from the last years she was operated by Greene Line Steamers. Photo post card of the Gordon C. Greene (from photo above). 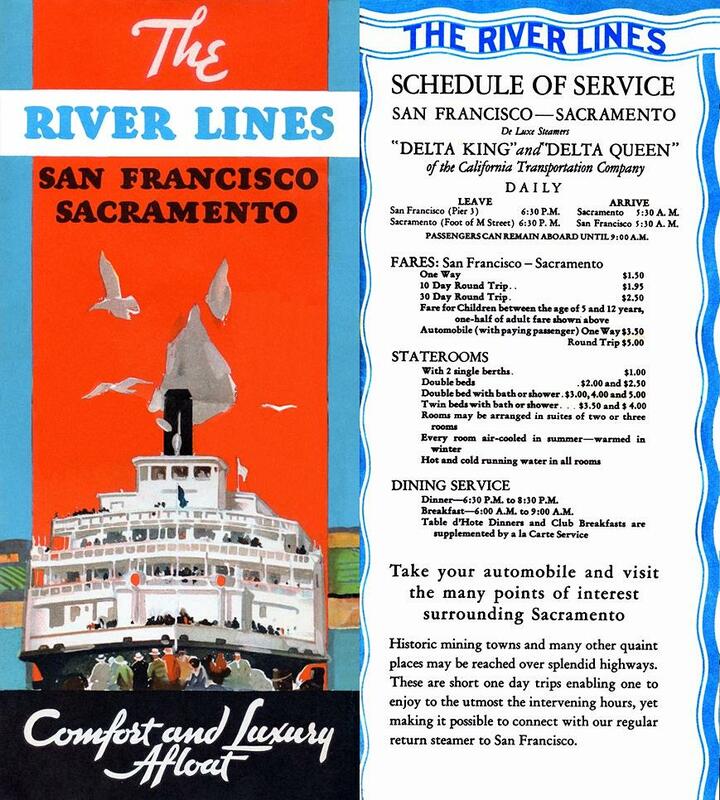 Attached scan combining half the cover with rates from inside on an early brochure for the RIVER LINES running the DELTA KING and DELTA QUEEN between San Francisco and Sacramento on the Sacramento River. This dates from 1939 per promotion within the brochure for the Golden Gate International Exposition "A Pageant of the Pacific" which a World's Fair held at San Franciso from February to December 1939. Also attached an enhanced photo of the DELTA QUEEN promoting the "Delta Route" inside the brochure. 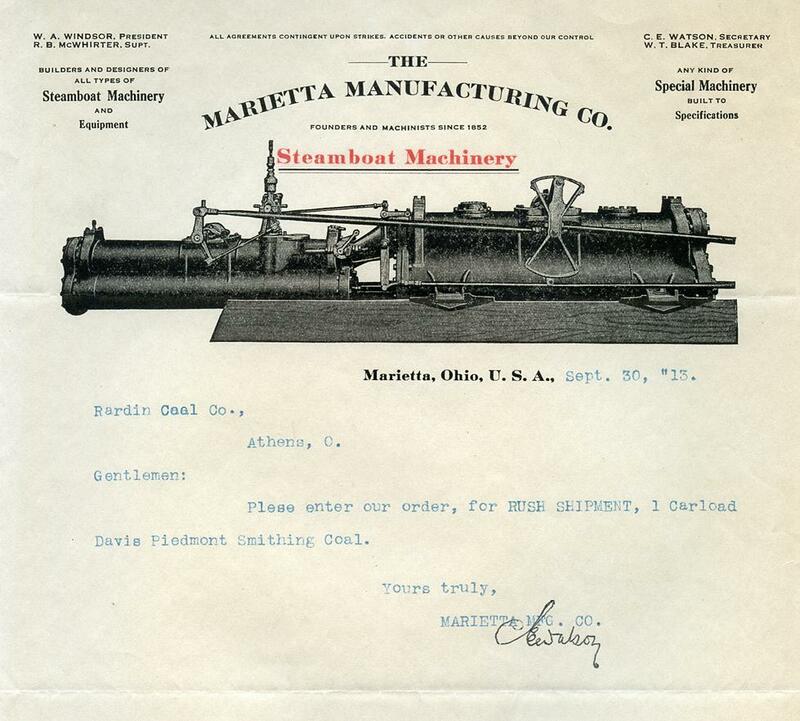 Letterhead "Steamboat Machinery A SPECIALTY" The Marietta Manufacturing Co. 17 Aug 1896. Attached the letterhead from the Steamboat Machinery division of the Marietta Manufacturing Co. 1913, requesting a railroad car load of coal from Rardin Coal Co. in Athens, Ohio which is 48 miles west of Marietta. 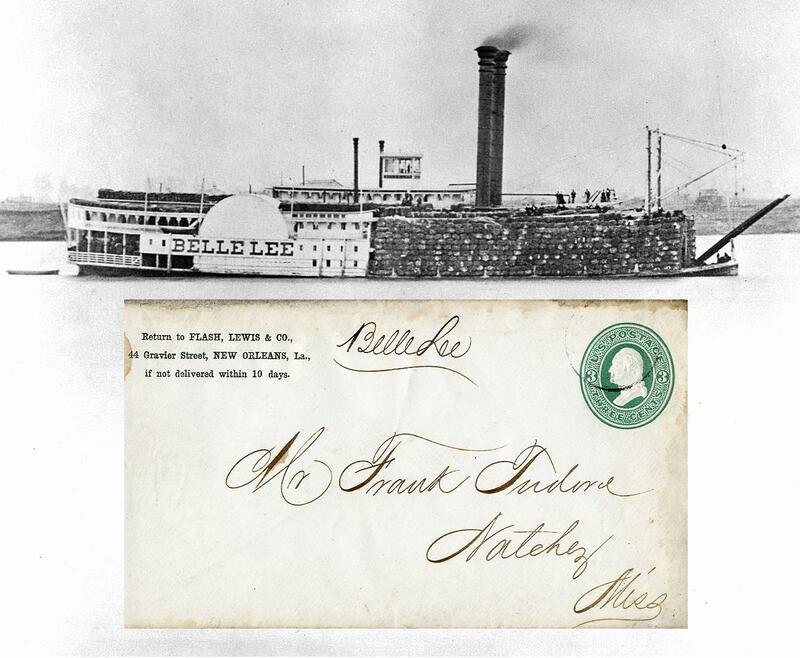 It took two steamboat engines like the on depicted on the letterhead to operate the paddlewheel on a sternwheeler. There would be an engine in the portside corner of the engine room image and another on the starboard side. 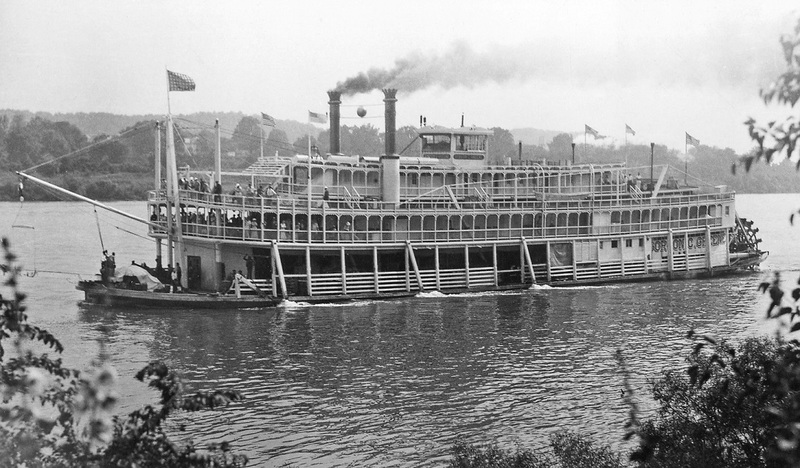 These engines were synchronized to operate the pitman arms connected to the open ends of the sternwheel to propel the boat ahead or astern and at what speed per orders transmitted by "telegraph" to the engineers from the pilot house. IT'S NOT OFTEN THAT YOU SEE A LETTERHEAD FOR A STEAMBOAT ENGINE MANUFACTURING COMPANY. THE ENGINE IS NOT YOUR REGULAR LEVER ENGINE. IT IS A TANDEM COMPOUND ENGINE WITH HIGH PRESSURE CYLINDER (THE SMALL ONE) IN FRONT AND THE LOW PRESSURE CYLINDER IN BACK LIKE THE ONES ON THE NATCHEZ IN NEW ORLEANS. [NOTE: THE STEAM ENGINES ON THE NATCHEZ (LAUNCHED IN 1975) WERE BUILT FOR U.S. STEEL CORPORATION'S TOWBOAT CLAIRTON IN 1925]. THE VALVE GEAR ON THE ENGINE ON THE LETTERHEAD IS DIFFERENT THAN ANY I HAVE EVER SEEN. IT WAS PROBABLY MARIETTA' MANUFACTURING'S OWN INVENTION. 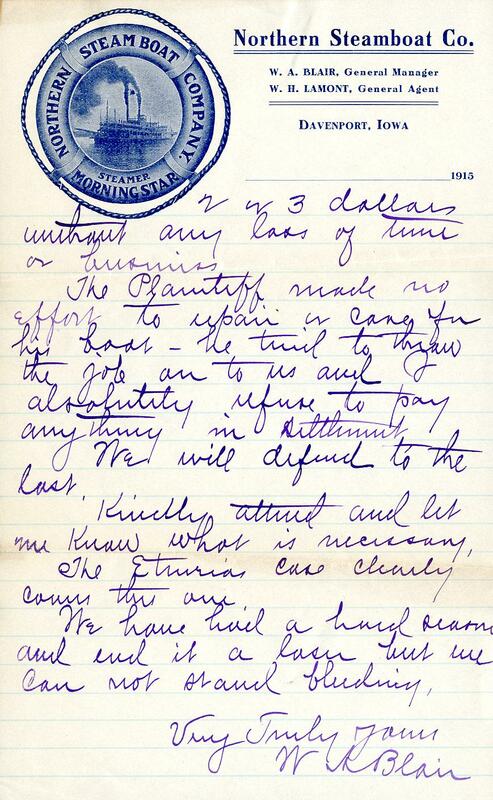 LOOKS LIKE THE LETTER IS IN GOOD SHAPE. THANKS FOR SENDING ME A COPY. P.S. Athens, Ohio (where Rardin Coal Co. was located) is 48 miles west of Marietta, Ohio in case anybody is interested. This is an envelope carried aboard Belle Lee. 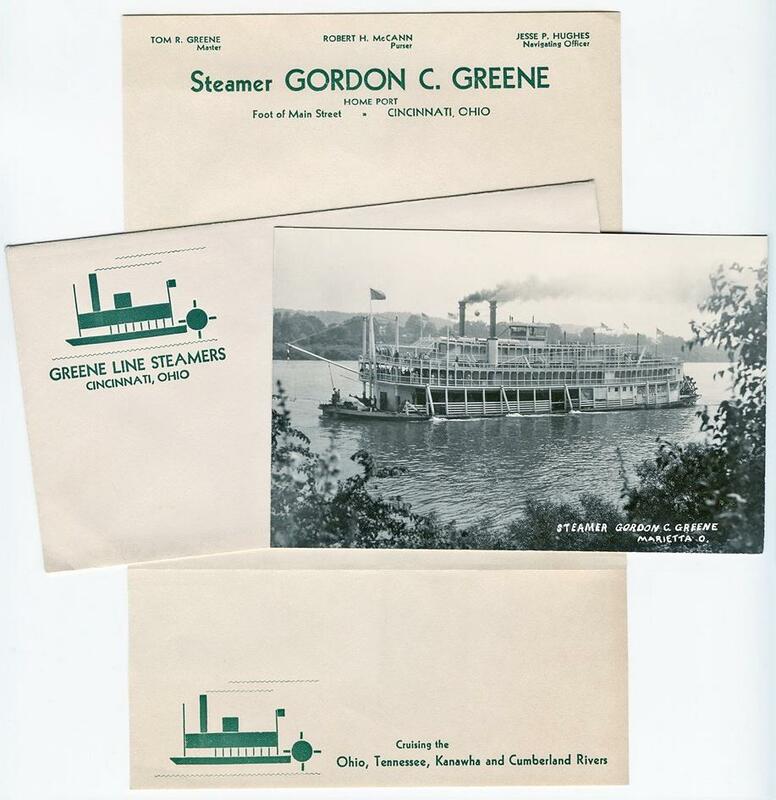 To see more steamboat envelopes, click here. 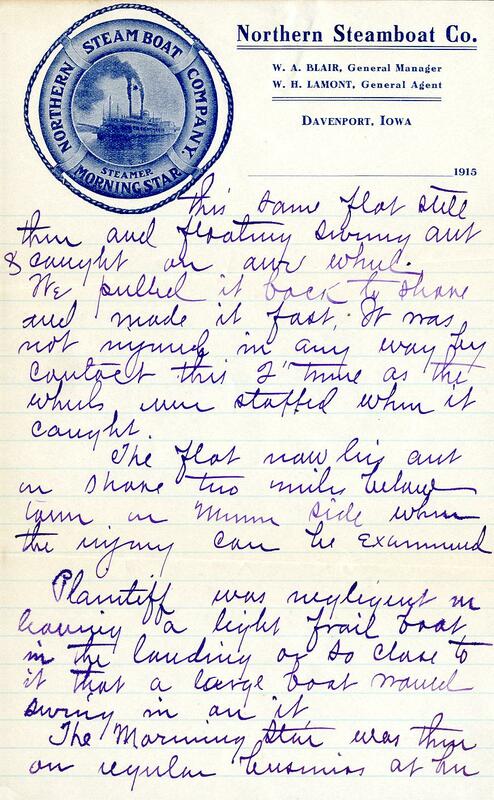 Attached are scans and my transcript of a 4 page letter about a pending law suit involving the steamboat Morning Star in 1915. Published in 1930 by the Arthur H. Clark Company, Cleveland, Ohio. We landed at Alma (Wisconsin) in the usual way and at the usual place with a breeze on shore. Plaintiff's little open flat boat (not worth $20.00) lay just below the jog in stone wall. this same flat still there and floating swung out and caught our wheel. We pulled it back to shore and made it fast. It was not injured in any way by contact this 2(nd) time as the wheels were stopped when it caught. The flat now lies out on shore two miles below town inside where the injury can be examined. Plaintiff was negligent in leaving a light frail boat in the landing or so to it that a large boat would swing in on it. 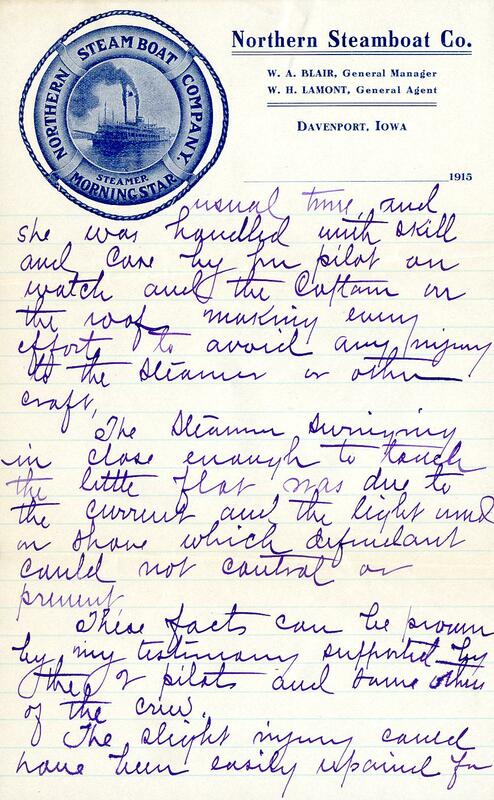 usual time, and she was handled with skill and care by her pilot on watch and the Captain on the roof making every effort to avoid any injury to the Steamer or other craft. The Steamer swinging in close enough to touch the little flat was due to the current and the light wind on shore which defendant could not control or prevent. These facts can be proven by my testimony supported by the 2 pilots and some others of the crew. 2 or 3 dollars without any loss of time or business. The Plaintiff made no effort to repair or care for his boat - he tried to throw on to us and I absolutely refuse to pay anything in settlement. We will defend to the last. Kindly attend and let me know what is necessary. The Etruria case clearly covers this one. We have had a hard season and end it a loser but we can not stand bleeding.